Add energy to your day, promote weight loss, combat viruses, suppress allergies, and promote total body health. Equilibrium Energy Superfood is the evolution peak of superfoods. If you find a better mix, we’ll give your money back. Add energy to your day, promote weight loss, combat viruses, suppress allergies, and promote total body health with Equilibrium Energy Superfood’s three-pack. Get three 2.3 oz jars for easy travel and storage in all your favorite places at a great discount. At the core of this superfood is raw honey. From there, 11 other superfoods are added—each one organic or wildcrafted, potent, and boasting its own numerous health benefits. Combined, these 12 ingredients bring harmony to a life filled with stress, toxins, and negative energy. Equilibrium Energy Superfood is made in small batches to ensure high quality, exact measurements, and consistency in every jar. To ensure our product never loses integrity, we use high-quality Biophotonic jars that only let sunlight in to improve the substances in each formula. Equilibrium Energy Superfood is ideally designed for athletes or anyone who lives an active lifestyle. Through naturally stimulating the nervous system, enhancing brain function, supporting muscle relief, and providing anti-inflammation support, each jar will keep you in the energy zone. 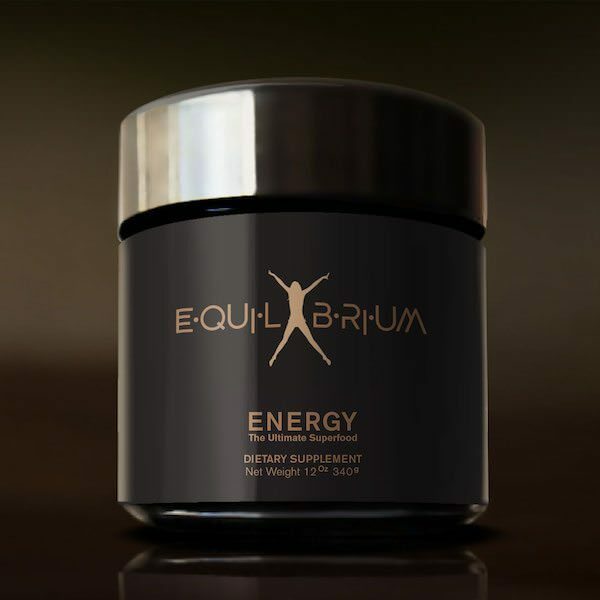 For those of us who seize life in its whirlwind of activity, Equilibrium Energy offers the support to never feel sluggish mentally or physically, midday or at the end of the day when you need time for yourself. "I have had knee pain since 2005 and I’ve had three knee surgeries. I started to take Equilibrium in the morning and in the evening, and about the third day I started to really notice the difference in the pain relief and I continued taking [it]. Now I run about 5 miles a day with no pain what so ever." "For 7 years I have suffered from an inflammatory digestive issue. A friend got me some Equilibrium, within 48 hours on this product the heartburn, cramping and indigestion that had become a daily challenge had subsided to almost nothing. Equilibrium is a godsend!!!" "I began using Equilibrium in April and within weeks had already experienced amazing results in various parts of my system. Among other things, my age spots have begun to disappear. My joints felt more flexible and a slight chronic pain in one of my knees disappeared." Raw Honey – Raw honey helps neutralize toxins, relieves pain, treats coughs better than drugs, and is anti-bacterial, anti-allergic, and anti-inflammatory. Raw honey comes straight from the bee hive, as opposed to supermarket honey, which often has zero pollen and is heat-treated to refine or alter the properties or flavor (strained, pasteurized, ultra-filtered, and others). Humans have been using honey for medicinal purposes for thousands of years. Ayurvedic practices in India, for example, claim that honey affects all three primitive material imbalances in the body. And honey’s relatively high acidity (pH level of 3.2 to 4.5) prevents the formation and growth of various bacteria, but when combined with human saliva, becomes alkalizing. To preserve the sublime quality of the our products, we choose the highest quality glass jars. Comparable to the packaging materials available on the market, these innovative jars sufficiently protect the sensitive products from the quality-lessening influences of light. The Biophotonic jars work like natural filters, only letting in the sunlight that protects and improves the substances in each formula, making our products a trustworthy and essential food supplement in every household. Where can I read more material about equilibrium? You can read more material about equilibrium and its beneficial ingredients in the following articles.